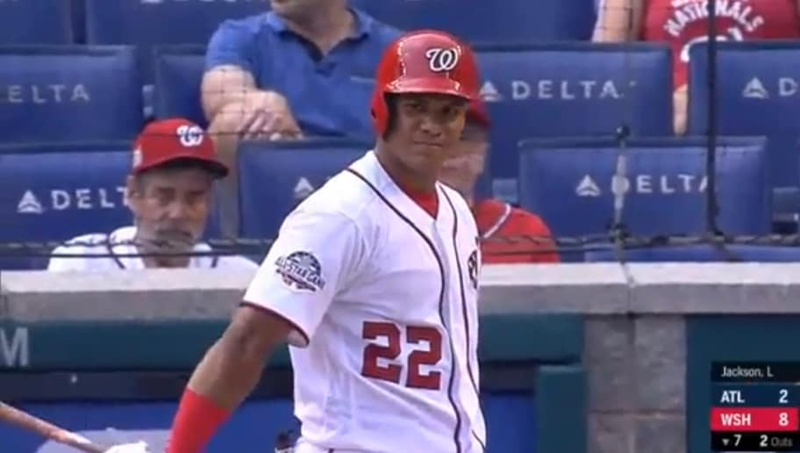 Juan Soto has been unreal since he's been called up to the big leagues earlier this year. Naturally, people can't just accept how great he is and acknowledge the success he's had at the plate. When he went yard against the Braves, it gave announcer Joe Simpson the opportunity to question if he's really 19 years old. Come on, man. Are we really going there? There is absolutely no speculation that Soto isn't the age he claims to be. The only thing that would make people think that is his insane abilities that are rarely seen out of a someone as young as he is. He's been destroying baseballs since the first pitch he saw in the bigs and hasn't slowed down. Why are we questioning his age now? The obvious reason you could look for is his Latina American heritage and the fact that he's been bullying the Braves. It's, of course, low-hanging fruit that has no truth around it whatsoever, so it's something that should be ignored. What shouldn't be ignored is the phenomenal season Soto is having.